20 Days of Miracles in Mindanao - Over 600 People Received Christ! It was Tuesday night in the Philippines. Julie answered the phone and heard Carol's voice on the line. "A plane has just crashed into the World Trade Center in New York… It's horrible…" Julie watched in shock as the scenes of September 11th flashed on the television screen. It was an agonizing time for her and the team. They were already in danger as targets of violent Islamic rebel groups. The situation was now to get hotter. 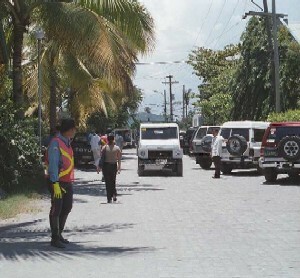 Two police vans with armed personnel escorted the team to their hotel after the conference. The streets had been cleared. The team was warned to avoid various places around the city. 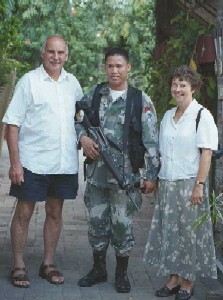 At 6:30 am., Pastor Signar, a police chaplain and captain in the military police, knocked on Julie's door. He was waiting there with two armed SWAT Team policemen, in full gear including their semi-automatic weapons. "These men are here to protect you," he said. "They will be with you until you leave. We want you to trust us that you will be safe." These two men would shadow Julie and the team for the remainder of the mission. They slept or walked guard outside her hotel doors and accompanied the team everywhere they went. We thank God for the provision of these two men and the help of a spirit-filled, born-again police Chaplain. 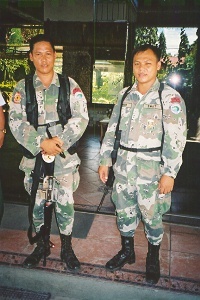 One of these faithful men in uniform gave his life to the Lord before the team left Gen-San.